Loose dentures often make eating and speaking difficult and the only way to hold them firmly in place is to use dental implants. Dental implants are made out of titanium and are placed into the jaw bone which grows around them making them very secure. Lower dentures can be a big problem and most patients struggle with them. Over time the lower ridge (upon which the denture sits) shrinks away leaving nothing to hold the denture in place and this makes the denture loose. Lower dentures have a small surface area which means that denture fixatives are of little use. Dental implants provide an excellent solution to hold a lower denture firmly in place. Patients can have either 2 implants or 4 implants. Some upper dentures can be loose for a variety of reasons. Sometimes patients have a shallow palate (a deeper palate provides better retention) or do not provide enough saliva (required to provide suction). Some patients have a ‘spongy’ palate, and any of these conditions can cause problems. Dental fixatives can often help with upper dentures but sometimes dental implants are the only real solution. We usually use 6 implants to retain an upper denture. These are for patients who want a smaller denture that doesn’t cover the palate. 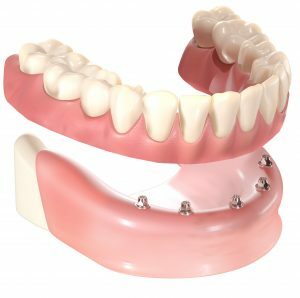 To achieve the cohesion (or suction) required to hold it in place, a conventional upper denture needs to cover the whole of the roof of the mouth, and even a standard implant retained denture usually requires the palate to be covered for stability. But some patients simply can’t tolerate this and for these patients an option is to have a horseshoe shaped denture which only connects with the ridge leaving the palate completely uncovered. This option usually involves having 6 implants which are connected together with a milled titanium bar. Another bar is set into the denture and the two bars clip together very securely. For more information, please do not hesitate to get in touch with our team today.